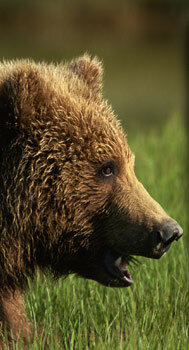 Most powerful and effective bear spray repellent - Guard Alaska. Stay safe in the woods and national parks! Buy yours here. Guard Alaska ultra hot bear pepper spray has proven so effective repelling these animals, it is registered with the EPA as a repellent for ALL SPECIES! Guard Alaska is one of the most effective and powerful defensive bear sprays available today. Only EPA approved sprays may be sold as deterrents and have specific minimum requirements that must be met. Guard Alaska has an EPA registration number on its labeling. You need something you can depend on in the woods. Treat all encounters with extreme caution! Bear pepper spray is an effective deterrent for stopping and preventing attacks. Carry on your belt so you'll always be ready or set it out at the camp so everyone has easy access to it. Some states now have hunting laws requiring possession. If you're a hiker in a national forest or any state park or wooded area where these animals are prevalent, you should carry this on your side. An encounter can be averted with no injuries with a simple blast to the face. One of the most effective and powerful available today. This product has proven so effective that it is registered with the EPA as a repellent for ALL SPECIES! Environmentally safe! Does not contain flammable or ozone-depleting substances. Don't forget to add bear pepper spray to your packing list! Probably the most frightening of experiences with an attacking animal is a confrontation with a bear. If you do come across one, you should obviously not approach it. Remember, you're in his habitat, not yours. When in bear country, it's common sense to take along some extra protection. This is an effective deterrent to attacks. Treat all encounters with extreme caution. Most will try to avoid contact with you if they can. Try not to surprise them. If you come across one, do not approach it. Slowly back away while watching it. Try to increase the distance between you and the animal. If he or she keeps following or approaches you, change direction. If it continues to follow you, stand your ground. Stay in a group if there is more than one of you. Try to scare it off by yelling, shouting, clapping your hands or otherwise intimidating it. Make as much noise as you can. Banging metal together or anything that makes a loud noise may deter them. But if not, you need to use your bear repellent pepper spray. You need to persuade them to leave you alone if you encounter one. If all that fails and you find yourself being approached or attacked, use your repellent. Spray the bear right in the face when it gets close enough. The spray shoots 15-20 feet and sprays in a powerful expanding cloud so aiming will be easy. When he or she retreats, get out of the area he was trying to defend. Alert the rest of your party of the location and report your encounter to the appropriate authorities if possible. This spray is specially formulated and has been tested on all species of bears, and is proven to work. Aside from using a large firearm, Guard Alaska may be your best defense. It’s difficult to match the beauty and majesty of the wilderness. Nature holds untold amounts of amazing creatures and marvelous sites. However, it is vital to remember that nature also holds untold amounts of danger. The terrain, weather, plants, and animals can all cause terrible injury, illness or even death if it’s not handled properly. One of the biggest risks that people face when they enter the wild is encountering a bear. Bears do not usually seek out humans unless they’re lured to their location with the scent of food or they feel that the humans are a threat to their territory or children. Many people spot them when they’re out hiking or camping, but attacks are rare. In fact, these creatures will usually run away from humans unless they feel that they are a direct threat to them or their cubs. Despite this, being challenged or attacked by one can still happen to anyone. That is why it is vital to carry around protection. Bear Spray is an incredibly potent pepper spray meant to deter them in the event of an attack. It is used very similarly to regular pepper spray, but it emits a cloud of spray instead of a stream and it is far more potent than regular pepper spray. There are various benefits to carrying this on you when entering the woods. Attacks usually only happen when the people who are involved don’t know how to handle the encountering. They may approach the animal or suddenly run away, which would only provoke an attack during an encounter. Buying this product is a great first step in keeping yourself safe. You should also learn how to avoid encounters and how to handle yourself in the event of a potentially dangerous encounter. Remember, the spray should not be used if it is leaving you alone. It should only be used when it's threatening or initiating an attack. Running is one of the worst things that you can do when you’re around any predator. Not only will it almost surely provoke an attack, but the chances of outrunning it are slim to none. They are also great at climbing and swimming, so climbing trees or jumping into a body of water to avoid them will probably not work. Spraying allows you to distract the animal and make a slow getaway during an attack. The effects of the spray are incredibly effective against bears. It causes intense irritation of the eyes, coughing, wheezing and overall discomfort. He or she will be far more occupied trying to clean the spray off than trying to attack you. As long as the spray is used correctly, it can be an incredibly useful tool for warding them off and stopping attacks. There are few options when it comes to dealing with attacks, but pepper spray is seen as one of the most effective and humane options. Trying to scare one off will not always work. Running will most likely only provoke an attack. Attacks usually only happen when they feel threatened by you. An animal shouldn't have to die or suffer from terrible wounds simply because it is trying to defend itself or its cubs. This spray allows you to effectively deter them and stop attacks without causing any permanent harm to them. The spray will wear off over a few hours and no lasting damage will occur. Mace Bear Spray is legal to purchase and use in every state in the United States and should be carried by anyone intending to enter woodland areas inhabited by them to provide a humane, effective and easy way to deter unwanted behavior. If you have any questions on the use of our repellent, please feel free to ask us.